In 2011 I wrote a post about the number of animal rights incidents posted on the Bite Back website (warning: AR extremist website) which logs many incidents of animal rights extremism around the world. The analysis only looks at the July – September period as it was too cumbersome to get all the figures for the entire year. 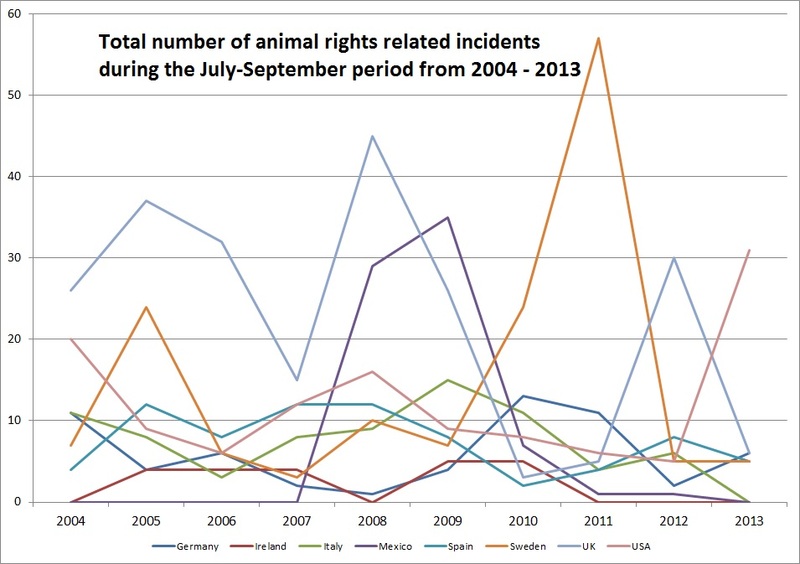 It was assumed that these figures should be representative of animal rights activity over a year. The analysis only looked at 8 countries which had the most activism – it is possible other countries now have higher levels of activism but were overlooked. This post provides an update, adding in data from 2012 and 2013*. The first thing that is clear is that in the last two years the number of incidents in the 3-month period has fallen from an average of 88 down to 55 (around 19 incidents month across all 8 countries). Most countries have seen a dip in the level of activism – but let’s look closer. The USA fell to the lowest number of recorded incidents in 2012, but then rose to 31 in 2013. The latest rise seems to be due to a spate of attacks against fur farmers including that have seen over 7,500 mink released between July-October 2013. The UK saw a spike in 2012 before falling back to the low level seen in 2010-11. Three quarters of 2012 incidents were related to the freeing of poultry from British farms (and almost all the rest related to farm animal “liberations” or anti-hunting activities). Sweden saw a massive drop from 57 incidents in 2011 to just 5 in the 3 month periods in both 2012 and 2013. Spain has seen a slight rise in incidents, whereas Mexico, Germany and Ireland continue to see a decline in activism. Overall it is reassuring to see the numbers of animal rights incidents decline in the last two years – however, it is possible that this could simply be down to lower levels of reporting of activism (on BiteBack). *Disclaimer: I may have made some small errors while counting by hand, however these errors should not be big enough to affect the statistics overall. It is also worth noting that not all global incidents are likely logged on BiteBack. Furthermore, I did not investigate the nature of each incident – some are arson attacks and vandalism, others are empty threats and the release or imprisonment of activists – I have not differentiated between these incidents.